"Romeo. Romeo. Wherefore art thou Romeo? " You know something is a timeless work of art, like this line from Romeo and Juliet, when it continues to be quoted, studied, and remade nearly five centuries later. Indeed, we still look to the plays and poetry of William Shakespeare for his masterful use of language and rhetorical devices even though some words may sound strange to our modern ears. So, before you pick up another Shakespearean play or poem, it might behoove you to review the Shakespeare translator and common words below. It'll introduce you to some of his terminology, allowing you to pick up on all the "wherefores" and "delations" with a bit more ease. Shakespeare's words are so different from the ones we use today. Alas, don't fret. Thy meaning will be obvious in just a moment. 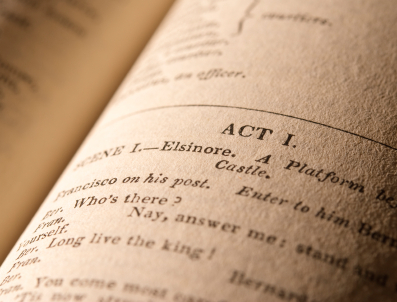 Have you ever tried an online Shakespeare translator? They're actually quite fun. You can turn any bit of everyday prose into the English of Shakespeare's day. Speak like the Bard in a couple of mouse clicks! Below, you'll find a handy list of some of the most common words used by Shakespeare translated into modern English. When you have a moment, take a look at the Shakespeare Birthplace Trust. They list even more words and phrases that, despite their inception over 400 years ago, we still speak today. Elizabethan English used a set of pronouns than we're used to. The first person -- I, me, my, and mine -- remains basically the same. Because of the oddities and complexities inherent in the language of Shakespeare, sometimes his works seem incomprehensible. However, you may be surprised to know that William Shakespeare's English is technically modern English! That's right, much of the language spoken by William Shakespeare (known as Elizabethan English) is still in use today, and is distinct from Middle English (the language of Geoffrey Chaucer, who wrote The Canterbury Tales) and Early English (as found in Beowulf). This does not mean, however, that Shakespeare's English uses the exact same words and phrases that we use but formed the basis of today's English. In fact, some of his phrases are very different from anything you've ever heard. Although students sometimes stumble through Shakespearean works, studying his writing builds our vocabulary. This was a more "proper" form of English but anything we read improves our vocabulary. Plus, there was so much innuendo and intrigue in his works that, once you get past the flowery language, it's actually quite thrilling. So, why not savor a nearly 500-year-old man in all his wisdom? Gather a group of friends and form a Shakespeare club. Together, you guys can play around with these seven ways to talk like Shakespeare! "Shakespeare Translator." YourDictionary, n.d. Web. 17 April 2019. <https://reference.yourdictionary.com/translation/shakespeare-translator.html>. “Romeo. Romeo. Wherefore art thou Romeo? “You know something is a timeless work of art, like this line from Romeo and Juliet, when it continues to be quoted, studied, and remade nearly five centuries later. Indeed, we still look to the plays and poetry of William Shakespeare for his masterful use of language and rhetorical devices even though some words may sound strange to our modern ears.In modern English, Juliet is asking, Why are you named Romeo? Or, more to the point, why must you be a Montague? (Her Capulet family was in a feud with the Montague family, and it would’ve been easier if he was from any other family. )So, before you pick up another Shakespearean play or poem, it might behoove you to review the Shakespeare translator and common words below. It’ll introduce you to some of his terminology, allowing you to pick up on all the “wherefores” and “delations” with a bit more ease.